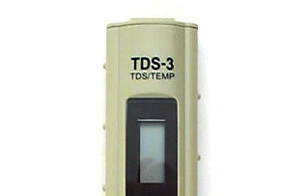 TDS can be easily monitored with a handheld tester. The U.S. EPA sets the maximum contaminant level for TDS at 500 ppm. The World Health Organization (WHO) sets the maximum contaminant level for TDS at 1000 ppm. In reality, many city water departments are in violation of the suggested TDS level because there is very little city water departments can do to reduce TDS. For practical purposes, small handhell TDS meters do an excellent job of reading TDS. The most common use for TDS meters is in the verification of the performance of Reverse Osmosis units. Typically , Reverse Osmosis rejects 90% plus of the total dissolved solids, so with a tap water TDS reading of 200 ppm, a reverse osmosis reading of 20 or less would be expected. Most fresh water that is consumed by humans falls in the <1000 ppm category. To the right, a table shows how the Water Quality Association ranks water according to TDS.